You have never seen a Twitter account like this. Meet @Glitchr_, the strangest thing in the Twittersphere. The account intentionally creates bugs and glitches within Twitter, so tweets break the normal height and width of a standard tweet (there's also an equally weird Facebook account, which BuzzFeed wrote about last year.). 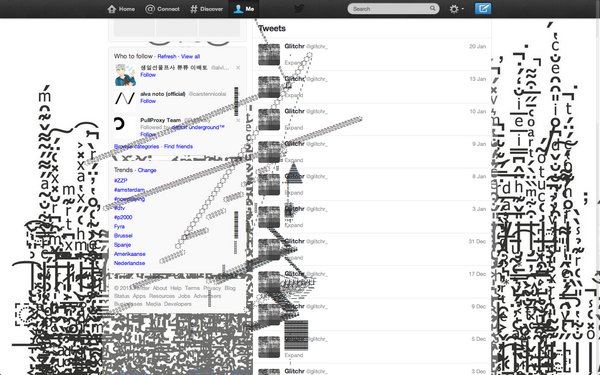 The result is some weirdly compelling social media art. Techcrunch reports the account is the work of a Lithuanian man, Laimonas Zakas. An interview with him from 2012 gave some insight into his methods: "Zakas is an artistic hacker who detects these digital bugs on Facebook, Twitter and Google and other online platforms. The name of his project is taken from an example of such networks as Flickr or Tumblr. By using scripting tricks, unicode characters and diacritics Zakas finds bugs in programming and produce textile digital art which is widely represented in his social pages"